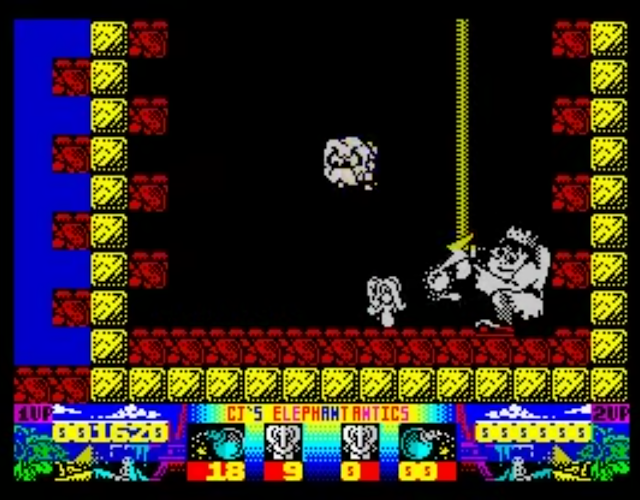 Indie Retro News: CJ's Elephant Antics - Florinthedwarf is back with another great ZX Spectrum review! 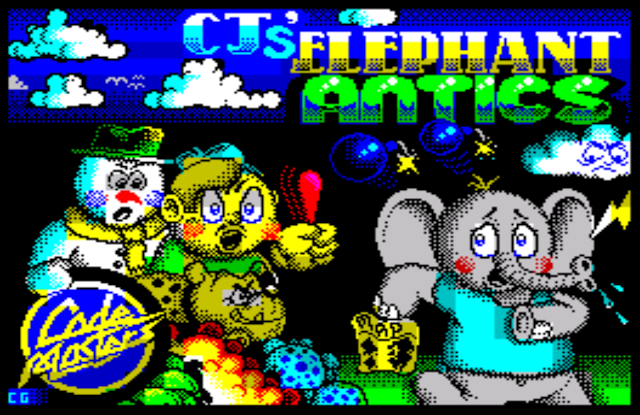 CJ's Elephant Antics - Florinthedwarf is back with another great ZX Spectrum review! Angry clouds, angry snowman, angry dog, angry guy from Rainbow Islands (I think) - you'd better cut it out with those antics of yours, CJ! What you get if you cross a globetrotting elephant, angry clouds and peanuts? 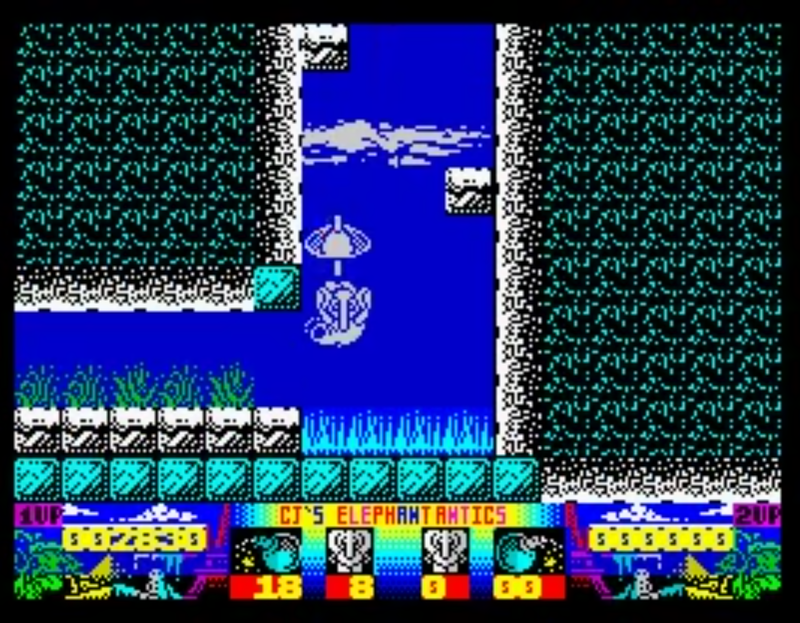 No, not an elephant who eats peanuts and gets chased by angry clouds around the world - you get CJ's Elephant Antics! Poor old CJ was on his way to England to be taken to a zoo but on the way, his plane experienced some issues and with the craft likely to crash CJ jumped, taking his trusty umbrella with him to aid his descent on to land. Unfortunately for CJ he ended up in France. Poor fellow. Now you must guide him back to his native Africa - all you'll need is some dodging skills, jumping skills and be a dab hand with a peanut. Poodles, snails, frogs and an angry cloud - we must be in France, then. What antics does CJ have in store? Well in this platformer, there are spikes, angry snails, angry policemen and a very angry cloud (I see a theme here) that follows you everywhere you go. A quick fire of your peanut gun, or trunk as it's more commonly known, and they *pop* out of your way. It's not so easy to get rid of the cloud as you'll need to carefully aim a bomb at that one to get it out of your way. Oh yeah, you can pick up bombs! Forgot to mention that. Bombs will help clear your way as you make your journey through the levels though, unlike your peanut ammo, bombs will need to be collected and will deplete the more you use them; which you in all fairness, you've probably guessed already. Yo CJ pump this party! The game registers quite highly on the tricky chart. 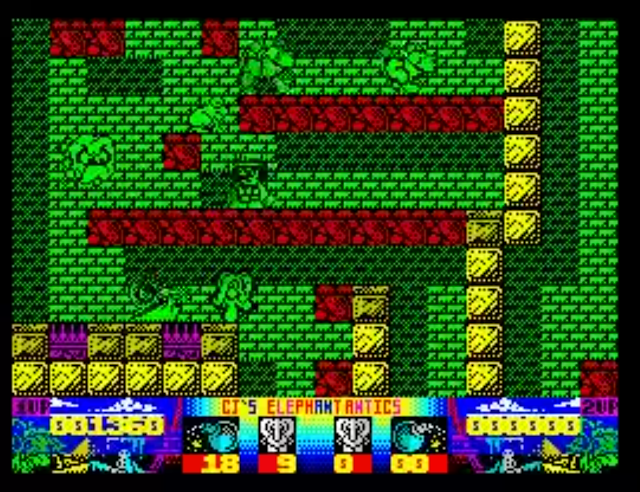 Each level has a lot going on so this combined with the relatively slow movement of CJ, makes timing jumps over spikes or trying to make big leaps over chasms, will often find you on the end of a spiky prong or falling down many metres of buildings that you spent about ten minutes climbing. Should you make it to the end of a level, you'll have a boss to fight off too which will involve shooting multiple peanuts and bombs at your enemy until they are no more. This would be hard enough but to make it even trickier, that damn cloud will usually make an appearance which literally hangs around you like a....cloud. Why does he want to hurt you? And why is he so angry? Maybe he's a little under the weather. What we have a here a solid platformer with very large levels, some nice animation and also a very good soundtrack. I mean, it's pretty clash-heavy too, there will be times where you may have to check where you are as old CJ will often blend into the background, but when you get used to it just becomes part of the challenge - if you want to put a positive spin on it. CJ himself is nicely animated as his trunk swings back and forth as he walks though he has got eyes that look like he hasn't slept for a year. Maybe it's an elephant thing. I hear insomnia is a big problem in a lot of elephant communities. A green elephant and blue penguins? What kind of place is this? Oh, it's Switzerland. Make your way out of France and you'll move on to the next country as you bound towards your final destination of Africa. Switzerland is next to greet you which, as you'll find in the game, is full on penguins....hmmm, maybe it was meant to be the chocolate type. But anyway, you've probably guessed again that they're the angry type and to be avoided like an ivory poacher. Don't let their cuddly looks fool you - they may walk in a style similar to Charlie Chaplin but these angry birds want blood. Why does everyone seem to hate elephants? Throughout the game there are some pick ups that you will come across. Apart from the bombs that were mentioned earlier, you will find power pills which make CJ invincible for a few seconds, and food which will give you some nice bonus points. The other thing that I've not mentioned yet it that CJ's Elephant Antics can also be played as a two player co-op game. Whoop! This sounds like an exciting prospect but the main bugbear here is that the screen will only follow player one around and should player two fall out of shot as it were, they will indeed lose a life. But to put a positive spin on this again, you can play that game of trying to get your co-op player killed by moving out of the screen when they're not ready. If this is sibling, it makes this acheivement just a little sweeter. Right, Michael? That must one strong umbrella. 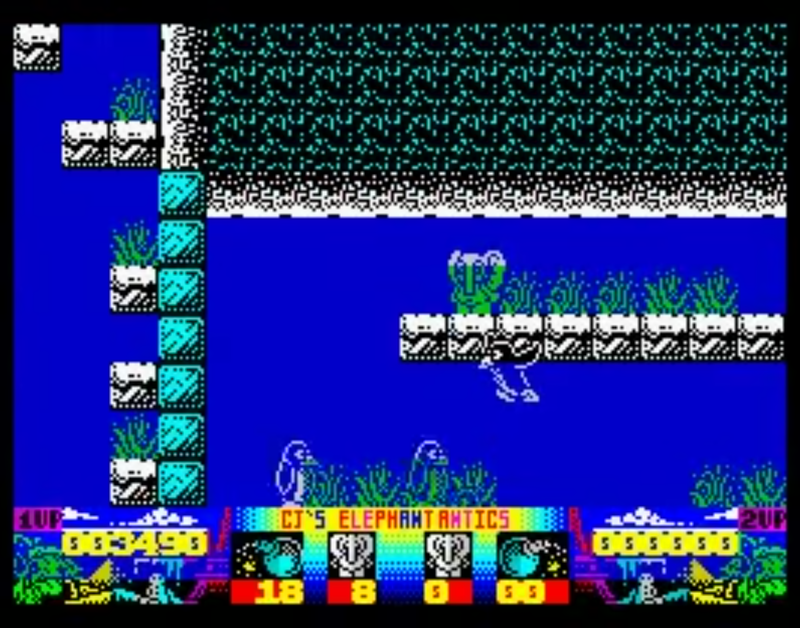 I'm not one to blaspheme but I remember first playing this on a mate's C64 (apologies Speccy fans) and being a big fan. I was excited to see that it was released for the Speccy too so was more than happy to get it loaded up when I got my hands on a copy. Impressed by its loading screen, I knew I was in for a treat. Though it is a tricky one, CJ's Elephant Antics is a well designed game which is a lot of fun as you jump around shooting peanuts at a plethora of creatures (and clouds), avoiding multiple obstacles as you try and find your way back home. The music is brilliant and there are a lot of nice touches, particularly CJ's little umbrella that pops out if you fall from a great height and the little *pop* animation that appears should you, or and enemy, get on the wrong end of a spike, animal or peanut. The game was followed by CJ In The USA a year later which was more of the same shenanigans that you find yourself up to in this game but this time, well in the USA, as the title suggests. All this talking and typing has made me a little peckish some I'm off for a snack.